1 of 5 In a mini chopper or a blender, combine mayonnaise, Parmesan, lemon juice, anchovies, 1/2 teaspoon of the garlic powder, 1/4 teaspoon of the salt and 1/4 teaspoon of the pepper. Puree until smooth and well combined, scraping down side of bowl if necessary. 2 of 5 Heat gas grill or grill pan to medium-high heat. Season steaks with remaining 1/4 teaspoon garlic powder, 1/4 teaspoon salt and 1/4 teaspoon pepper. 3 of 5 Stack large leaves of romaine, and cut in half lengthwise along the rib. Then cut crosswise into 1-inch pieces. Repeat with remaining lettuce leaves and transfer lettuce to a large bowl. 4 of 5 Grill steaks for 4 to 6 minutes per side, depending on thickness or until meat registers 130 degree F on an instant-read thermometer for medium-rare. Grill an additional minute per side for medium. Remove steaks to a cutting board and tent with foil. Let rest 5 minutes. 5 of 5 Pulse dressing again to blend, then toss with lettuce. Divide salad equally among four plates. 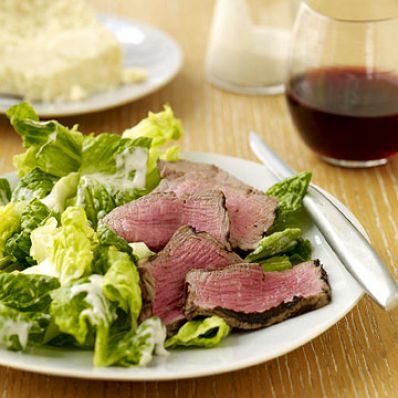 Thinly slice steak, then fan over salad on each plate, dividing evenly.